Get a FREE online smog check diagnosis when you use any smog check coupon from our site. Visit a SmogTips certified smog station and have one of our ASE certified experts diagnosis your test results online for free. How does it work? It's simple. Use a smog check coupon from one of our several hundred certified smog test stations. 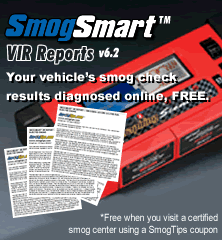 Make sure you show the smog station your SmogTips® coupon code so your visit is recorded. We get a credit, and this allows you to get, a free online diagnosis. This is an exclusive offer for SmogTips customers. What will this report explain? Our ASE certified VIR (Vehicle Inspection Report) diagnosis will help you understand your vehicle's smog check results. California law requires vehicle owners receive a VIR from the smog station where their vehicle was inspected. The VIR is an invaluble tool in diagnosing your vehicle's smog check results. Our report will begin by explaining the abbrevations listed on your VIR. If your vehicle failed for high emissions, we will cover the possible faults which cause an increase in emissions of HC, CO, & NO. If your check engine light or MIL is on, and trouble codes are present, we will explain those as well. Why do I need this report? To better prepare you in communicating with a smog technician if you happen to need smog repairs, or if your vehicle passes, to get a general overview of its emission system efficiency. How important is my VIR? Your VIR contains invaluable information regarding the presence and proper connection of required emission components, engine diagnostic codes and freeze frame data stored in your vehicle's Engine Control Unit (ECU), results of functional tests conducted during the smog inspection, and most importantly if your vehicle underwent a tailpipe test, an accurate account of its exhaust emission results during the smog test. VIRs are commonly used by smog check repair technicians in assisting the diagnosis of smog check results. Whether a vehicle has failed or passed the smog check your vehicle's VIR is an invaluable diagnostics tool. The VIR helps technicians determine if and where to begin smog check repairs, and offers valuable information about an engine's general and specific emission problems. Smog technicians often determine where to begin a smog check diagnosis based on information from the VIR. Your VIR diagnosis will offer an in-depth and non-biased look at a vehicle's smog check results. It indicate the reason your vehicle passed or failed the smog check in detail. In the unfortunate event your vehicle failed the emissions test, your VIR report will discuss in detail the three harmful pollutants (HC, CO and NOx), and explain their typical causes. Your report will also discuss any repairs which might be required to pass the next test. The information you receive will be extremely valuable when it's time to service or repair your vehicle. Keep in mind, your smog technician will be willing to explain your vehicle's smog failure in much greater detail, when he/she knows you've done your homework and are educated in your vehicle's smog check results. Preparation and knowledge is a must when it comes to making cost effective decisions when dealing with smog check failures. Not Eligible For Free Diagnosis: If the smog station you visited is not listed with us or you did not use a smog test coupon from our site, we can not provide you with a free diagnosis as we have no way of being reimbursed for our service. If you choose, you may purchase your VIR diagnosis through PayPal® ($12.95).